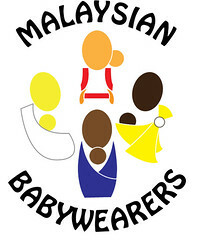 Our PR Officer, Adriana, will be representing Malaysian Babywearers on LIVE TV this Sunday, 28 March, 2010! Do tune in to watch her and tell others to do so too! We look forward to this milestone achievement in our history of promoting babywearing in Malaysia :D Thank you, Nasi Lemak Kopi O, for giving us this opportunity, and also thank you, Alin, a fabulous member of Malaysian Babywearers who mentioned us to the show in the first place. Its only March and already babywearing has been featured in two media outlets - the February issue of Bonda magazine, and the Tuesday, March 9 edition of the Ratu section in Berita Harian. Thanks to the ladies at ibu Family Resource Group for inviting our PR representative to write this article on babywearing. 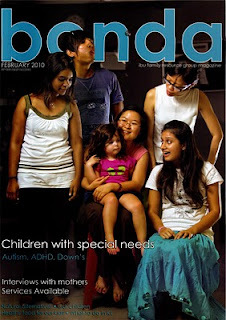 Bonda is a lovely magazine published by the ibu group. For enquiries about the magazine, do contact ibu house. The full text of the Berita Harian article cannot be found at the original source but was copied and blogged for posterity by a few babywearing bloggers here and here. I would say that even with babies who are born healthily and with normal birth weight etc, infant babywearing has to be handled with care. It is ALWAYS important to look for signs of changes (in skin colour etc.) and discomfort (baby squirming and trying to get out etc.) and do trust your instincts if you feel baby is not comfortable or unsafe. Have a read at the above article. It is not meant to scare you off babywearing but more like a safety precaution for all of us who need to wear our babies at that young age.